Srirama Navami, Sri Ramanavami, Sri Rama Navami Festival, What is Sri Rama Navami? Sri Rama Navami is very significant festival for Hindus. This festival is celebrated to commemorate the birth of Lord Sri Rama. Sri Rama is the son of Dasharatha, Who is the king of Ayodhya. Sri Rama is the seventh incarnation of Lord Vishnu and the main charecter of the Ramayana. Ram Navami celebrated each year on ninth day of Shukla Paksha of the hindu lunar month of Chaitra. On the day of Sri Rama Navami , the house is thoroughly cleaned and decorated. People worship Sri rama and offer him prasad, fruits and flowers. People gather near by ram / vishnu temples and perform Seeta rama Kalyanotsavam. 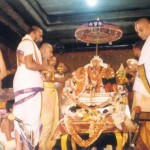 Idols of seeta, Ram, Laxman and hanuman are taken out as part of a procession on the streets. Sri Rama Navami celebrations performed in Ayodhya in Uttar Pradesh and Ramesvaram in Tamil Nadu, and Bhadrachalam Temple in Andhra Pradesh are very famous and attract lakhs of devotees. 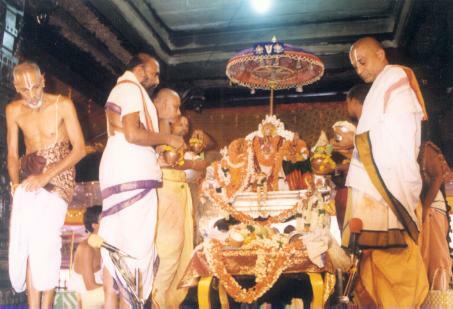 In these days, ISKCON temples are celebrating this festival in a grand manner. This is also the last day of Chaitra Navratri clelebrations or Vasantotsavam. Swaminarayan Jayanti is alos celebrated on the same day in the state of Uttar Pradesh.